The mega fight between Floyd Mayweather and Manny Pacquiao in Las Vegas for welterweight title received high ratings in China on Sunday. The bout, which was broadcast live and free by China Central Television in the morning, received a rating of 0.6466%, Tencent news reported. The battle at the MGM Grand Garden Arena, billed as the "Fight of the Century", attracted far more viewers than popular TV shows mostly aired at night. Mayweather extended his perfect record to 48-0 with a unanimous points decision. The bout was also one of the most popular topics on Chinese social media Weibo, with most users showing their support for Pacquiao. "I think Pacquiao is the glory for the whole of Asia," one commented. Some jabbed at Mayweather over his over defensive style and disagreed with the judges’ decision. 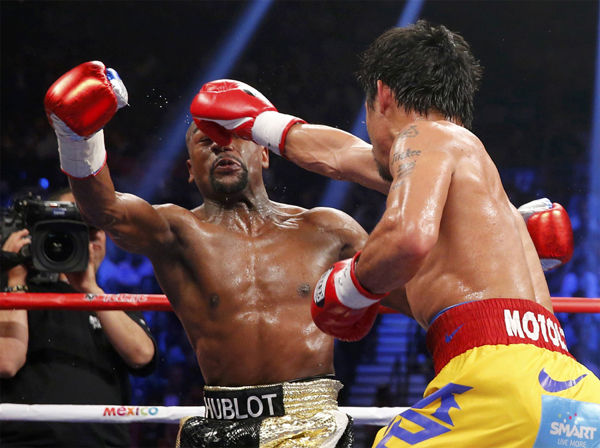 "Mayweather wins in the arena, but Pacquiao wins in life," a Weibo user said. China's boxing world champion Zou Shiming was among the stars that watched the bout live in Las Vegas. Pacquiao and Zou share the same coach, Freddie Roach. "I wish Zou would one day stand in the same arena," a fan said. Others were glad to see the fight without paying any money. “I did not expect to see it for free,” one said. The fight, ordered through cable operators, cost $90 for standard definition and $100 for high definition in the US, one of the most expensive pay-per-view sports events.